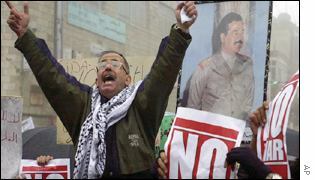 Media in the Middle East have welcomed this weekend's international demonstrations against a possible war against Iraq. Comment in Iraq itself is enthusiastic. "The world is with us," declares the ruling Ba'th Party newspaper Al-Thawrah. "What is happening at the popular level in the world is a phenomenon unprecedented except at a particular stage in the Vietnam war," it says. An unscheduled commentary on state-run Iraqi TV hails "the international day of opposition to the US-British-Zionist aggression". It credits Iraq's "explicit, decisive and confident stand" with prompting people worldwide to "shout in the face of the accursed US-British-Zionist axis of evil that they reject war for the sake of oil". Syria's ruling party newspaper Al-Ba'th pays tribute to "the greatest referendum of world public opinion ever". The government-owned Al-Thawrah agrees, concluding that the protests show that "an overwhelming majority reject the logic of war and aggression and see it as a means of dominating the world and its resources". The Tishrin daily says the protests send a message to George W Bush but wonders if it will be heard. "All the indications are that the US administration is heading in the opposite direction. "Will it return to the path of international legitimacy and heed the calls of opposition to war and the calls for a peaceful solution?," it asks. In Jordan, the pro-government Al-Dustur believes "this huge popular phenomenon sends a clear message to the world's decision-makers that 21st Century man is opposed to the law of the jungle and the logic of force". A commentary on Iran's state radio likewise sees lessons for the US. People's "quest for freedom and their vigilance and awareness... have led them to express their objections to the Americans who are trying to start a war with Iraq," it observes. "There may come a day - it will come soon and we can see that happening right now - that wherever Americans go they will be hated by various nations," it warns. Newspapers in the Gulf share the general mood. Qatar's pro-government Al-Watan cheers "an international referendum sending a clear message... that the USA, Britain, Australia and all those supporting the war option will find it very difficult to continue on this doubtful and destructive path". Saudi Arabia's Al-Riyadh notes approvingly that "the countries that have to a great extent backed America in its war with Iraq, such as Britain, Italy and Spain, are those witnessing the largest concentration of protests". Commentaries also link the protests to Hans Blix's report to the UN Security Council. "From the Security Council to the streets of world capitals, the official and popular expression is one of opposition to war," declares the Saudi Arabian Al-Jazeera. Similarly, Al-Khalij in the United Arab Emirates says the UN debate and demonstrations together show that US plans are rejected internationally, "with the exception of some isolated voices in the UK, Spain, Australia and Israel which are discordant with international public opinion". The UN session itself continues to attract comment. The London-based paper Al-Quds Al-Arabi believes "Iraq won a major diplomatic battle... because of the good way it has managed the inspections crisis". "Hans Blix has pulled the rug from under Washington's feet and left it alone facing the entire world," it says. The Jordan Times sees grounds for optimism and hopes the US will listen. "It would be folly to ignore these positions and insist on a course of military action that could wreak untold damage to international peace, security and global wellbeing." As Arab foreign ministers meet in Cairo, Jordan's Al-Ra'y also looks at the forthcoming Arab League summit. "We hope this summit will be able... to come up with a strict and clear decision... to avert Iraq a possible war which will definitely affect the whole region," it says.